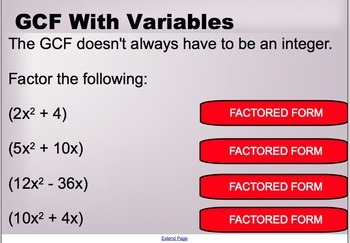 In this interactive SmartNotebook lesson, students will review their knowledge of common factors and apply them to increasingly complex polynomials. Using their knowledge of common factors they will learn a new way to factor complex polynomials by using the grouping method. 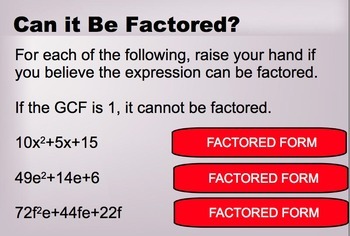 With a concrete understanding of factoring by grouping, students will then participate in a group challenge problem based on a real world application. 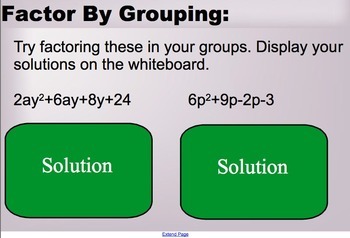 For additional lesson timing and sequencing, look for the "Common Factors and Factoring By Grouping Lesson Plan" in my product library.